13. Corinthian Hall, Kansas City Museum MO. This stunning building was constructed in 1908 for the Long family in the Beaux-Arts style and named because of the large columns on the front of the home. It has 35,000 sqft and is presently a museum open to the public. #12 is Greystone Manor located in Beverly Hills CA was completed in 1928 for oil tycoon Edward Doheny to give to his son as a little present in the Tudor Revival style. With 55 rooms and 46,000 square feet it has enough room to stretch your feet. Currently it open to the public and is used to hold classes. The grounds are open as a park. 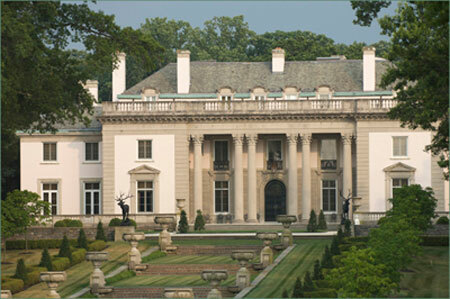 #11 Nemours Mansion located in Wilmington DE is a Louis XVI style occupying 47,000 square feet and was completed in 1910. The interiors still contain many original furnishings and are finely appointed to meet the most refined Edwardian pallet. Today the home and the magnificent gardens are open to the public. #10 is the White House in Washington D.C. . Built from 1792- 1800 and renovated and restored countless times, the home holds 55,000 square feet. Last I heard you needed to get assistance from your state senator to have a tour of the property. Perhaps things have changed? 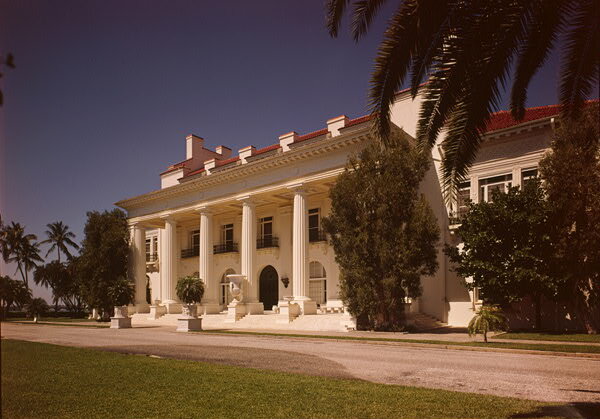 #9 Whitehall in Palm Beach FL was built for wealthy business man Henry Flagler in 1902 in the Beaux-Arts style. With 60,000 square feet and 75 rooms it was a fitting vacation home. Presently it is used as the Flagler museum. 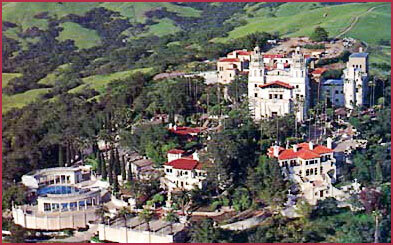 #8 is famous Hearst Castle in San Simeon CA. Construction began in 1919 and didn’t stop until 1947 when Hearst became too ill to reside at the property. With 60,645 sqft set over numerous buildings the complex was filled with antiquities Hearst purchased from all over the world. The castle is currently open to the public as a museum. #7 is located in of all places Ohio. That’s right little old Ohio. 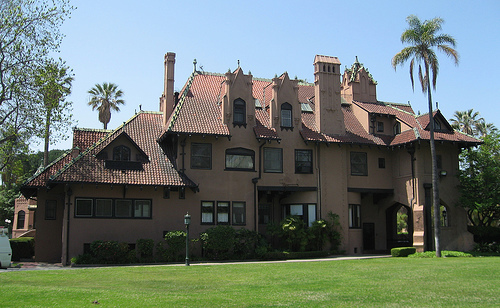 Stan Hywet Hall was constructed in 1915 in the popular Tudor Revival with 64,500 square feet. With grand gardens and fine furnishings the home is currently operated as a museum. So if you’re ever in Akron Ohio, check it out! #6 is the Breakers in Newport RI. Perhaps one of the most famous of the gilded mansions this home was constructed for Cornelius Vanderbilt II as a summer get away. 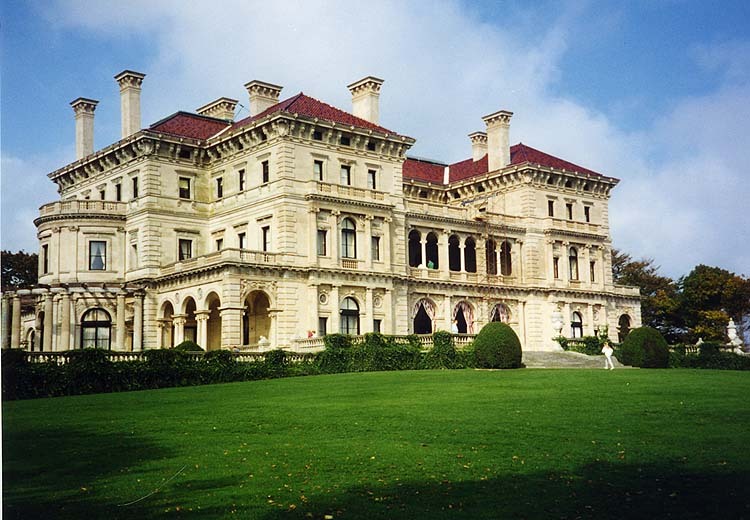 Host to some of the most famous parties of the gilded age the Breakers is a true testament to the wealth of the Vanderbilts. Completed in 1895 with 65,000 square feet and an ocean front lawn the property is in an ideal location. Today the Breakers is open as a museum and well worth the visit! #5 is a true tragic story. 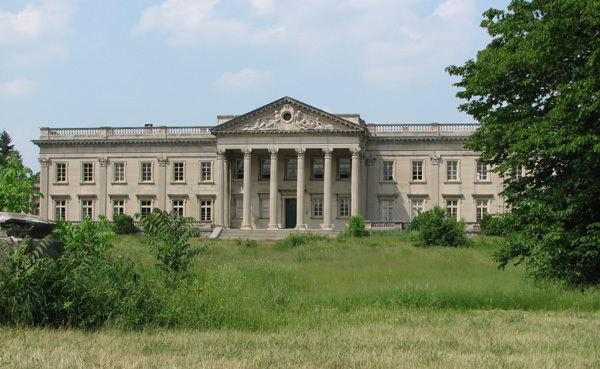 Lynnewood Hall in Elkins Park PA. Completed in 1900 with 70,000 sqft it contains 110 rooms. Since 1952 the home has slowly been picked apart. During the following years mantles, interior trim and other unique architectual elements have been sold off to keep the enormous building running. Derelict and falling apart the home has been left to rot. There is hope that in 2011 there are plans to purchase the property and restore it, but as it is it still sits waiting for a helping hand. 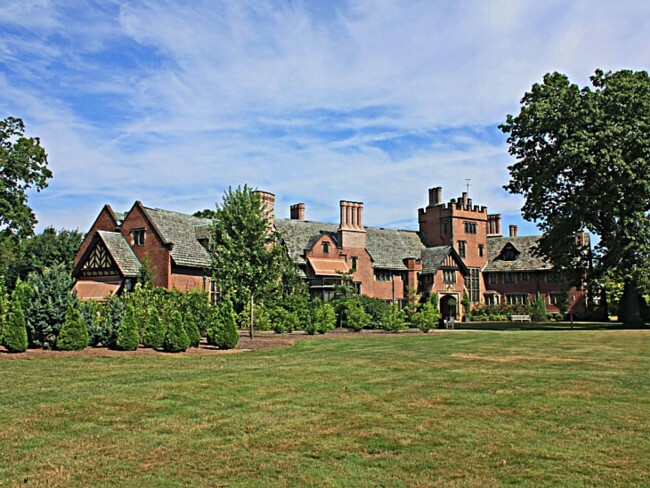 #4 Meadow Brook Hall in Rochester Hills, MI is a 1929 tudor revival mansion. 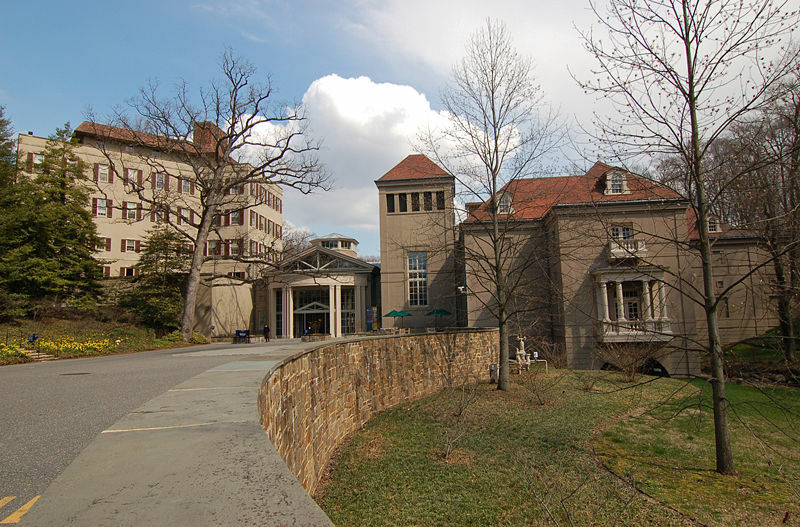 The 110 room, 88,000 sqft mansion was built by the widow of the wealthy auto industrialist John Francis Dodge and her second husband. Today the home is open as a museum and open to hosting various public and private events. 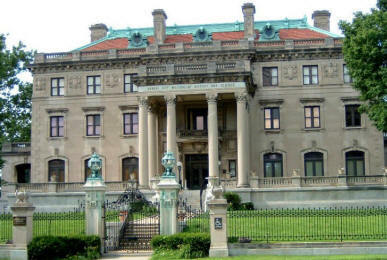 #2 is Oheka Castle in Huntington NY was built from 1914 to 1919 contains 127 rooms with 109,000 sqft. The home as with many of these estates fell on hard times and was used by various institutions and eventually became vacant. During the years it stood vacant more than 100 fires were started but the home would not go down without a fight. Finally in 1984 a private developer began the largest restoration project one could ever imagine. After 30 million in restoration costs the owner claims the property is 70% complete. Today the building is used as a hotel as well as for public and private functions and is open to the public for tours. #1 Spot goes to Biltmore Estate in Asheville NC. With 250 rooms and 135,000 sqft it is still America’s largest owned private house. The fittings on the interior of this home goes without saying as it was constructed by George Vanderbilt II in 1895. Today Biltmore is one of Americas most famous museums of the gilded age.